Ernst Baltrusch is a Professor of Ancient History at the Friedrich Meinecke Institute of the Freie Universität Berlin. Baltrusch’s work focuses on the history of Judaism in antiquity, ancient international law, the history of Sparta, especially regarding foreign policy, and the transition from the Roman Republic to the Principate. In Topoi I, Ernst Baltrusch was involved in Area B Historical Spaces. 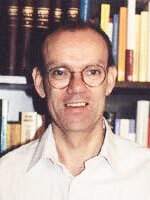 In Topoi II he is member of the research group (B-1) Routes-Waters-Knowledge. Flavius Josephus - von Jerusalem nach Rom? "Ambigua gens: How to study the history of ancient Armenia?" Das Imperium Romanum – ein Imperium sine fine? Part of: Imperial Space. The Organisation of Near Eastern Empires from the Second Millennium B.C. to the Second Millennium A.D.
(B-1-6) Die bildliche Darstellung von Raum in der Tabula Peutingeriana: Aneignung durch Kartographie?